You know…time to write another blog post. But, what happens if you have no clue what you’re going to write about? Or, worse, you’re stuck with a bad case of blogger’s block. You can spend hours looking at other blogs, hopping on to Quora to see what people are asking, or just reviewing your blog’s existing content for ideas to expand on – all in an attempt to come up with a blog topic to write about. This can end up making you exhausted, especially if you have to search for a blog post idea every time you write a new post. And over time, your blog becomes a chore, not a passion. What happened? Blogging used to be fun and you had no problem coming up with 20 blog post ideas in minutes. Half the time, though, you just were winging it, but it was all working out, nonetheless. Now, the time has come to crank out another post, and you’re drawing a blank. You know what? You’re not alone. The biggest problem most bloggers face is planning and creating stellar content on a regular basis. Bloggers have no posting consistency, no editorial process, and no time for topic generation. It’s understandable, though. If you’re a blogger, you’re most likely doing this alone. You’re your own editor, social media manager, graphic designer, marketer and more. And if you have a family to take care of and possibly a full-time job, finding the time just to plan your content – let alone actually writing a blog post – can be a challenge. But, there’s a secret why many blogs remain popular. Sure, they have epic and useful content that people devour and share, but these blogs remain popular over time partly because they preplan things. And a great way you can do this on your own blog is with a content calendar. I know. It sounds easy right? Just plan out your blog posts. But, for a lot of us, creating a content calendar and sticking to is often difficult to do. Having a content calendar can turn your blog from being a hobby that you write about whenever you like, to professional blog status with a system in place. And better yet – it can help put your blog on the map. Wouldn’t it be nice to have a blog that ran like a well-oiled machine? There would be a plan, a system, and a process from inception to publication without any hiccups or bumps along the way. And when that happens, everything falls into place and you can focus on growing your blog. You can get all this – and more – with a content calendar. Let’s look at four ways using one can help you grow your blog. Raise your hand if you have blog topics scattered across post-it notes, notebooks, Google docs, Trello and Evernote? From the old school method of pen and paper to the digital version, if you brain dump your blog post ideas all over the place, finding them, sorting them and using them just ain’t going to happen. And don’t think that using your day-to-day calendar or planner will do the trick. If you have one calendar that holds your appointments, your children’s activities, your spouse’s schedule, and more, adding your blog content schedule won’t really work that well. Instead of scattering your blog post ideas or using one calendar for your life and blog, go with a separate blog content calendar. It will keep you organized because every phase of writing a blog post will be in one place. You’ll be able to plan and track your deadlines, topics, graphics and anything extra like links, in your content calendar. Being able to preplan a month’s worth of content for your blog is a big accomplishment. 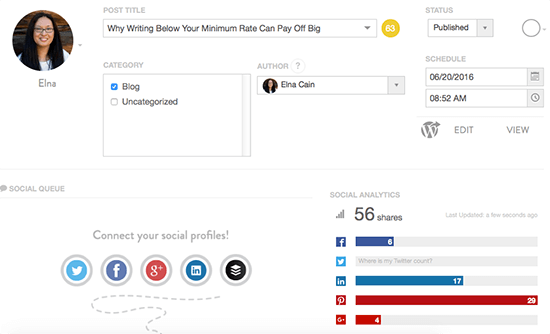 With a content calendar you can see what you’ll be blogging about for that month. It can help you identify holes in your content that maybe you aren’t covering and can help you see which micro topic you might be over-focusing on that month. For example, if you’re a food blogger, you might notice you have six dessert recipes and only two dinner recipes. 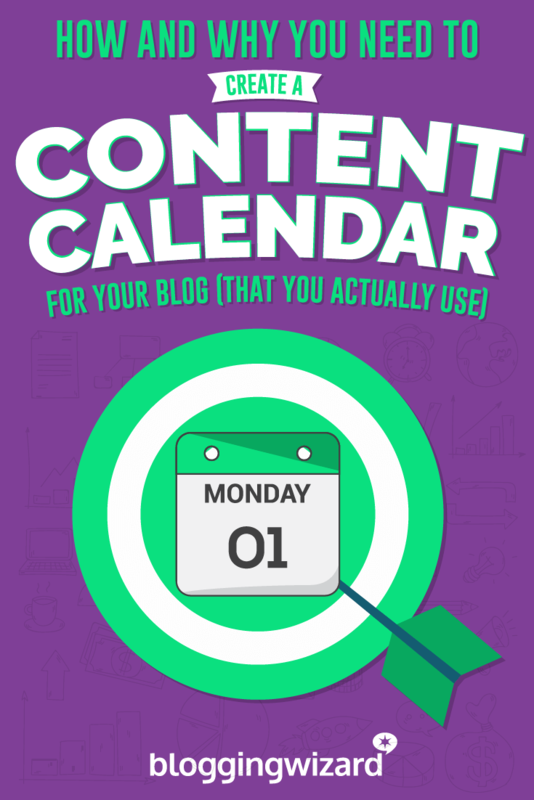 By looking at your content calendar you can balance your blog’s content for the month easier. There’s something about writing out your plan that helps you stick to it. Research has shown that 42% of people achieve their goals when they write them down first. Planning out your content and then assigning dates to each of your blog posts is a powerful thing. It helps you take action and lets you see your accomplishments as the weeks go by. There’s also a lot less guesswork going on when you know what you’ll be writing about. No more searching Pinterest at midnight to find your next blog post idea. Do you have a content marketing plan? You should! If you’re a blogger, then you have a content marketing plan – even if you don’t realize it. All bloggers want traffic right? Well, developing a content strategy will help you get there. This helps you identify your niche, target audience and overall brand for your blog. Having a content calendar can help you solidify these areas. For example, you might find that your posts on productivity hacks for moms do much better with engagement and shares than your weekly “frugal finds” series. Based on that finding, you can shape your content calendar to include more content your audience wants – productivity hacks – and less of what your audience doesn’t want. Now that we know why a content calendar can be helpful to growing your blog, let’s look at how to create one. No matter what type of blogger you are – beauty blogger, mom blogger, marketing blogger or even a pet blogger – the content calendar you use will have a similar setup. Having an all-in-one place to chart your blog’s content plan is what will help you stay organized, consistent and on track to helping attract your ideal target audience. You may or may not need all of this information, but it’s handy to have if you want to stay on top of your content schedule. There are several tools – mostly free – that you can use to create a content calendar. Let’s look at three of them. Trello is a project management tool that can be used in collaboration with your team or solo. Trello has boards for what you want to keep track of. For example, if you have several blogs, you can assign a board to each of your blogs. Within each board are lists. You can break down your board topic into lists or sections. Taking the blog example, your lists can be Blog Topic, Date Assigned, In Progress and Published. In each list are cards. For this example, each card is a blog post. 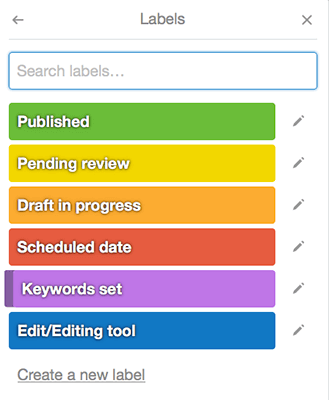 Trello also has color-coded labels which helps organize your content calendar. These labels can tell you at a glance if your post needs to be edited, if you have keywords set, or if it’s been published. 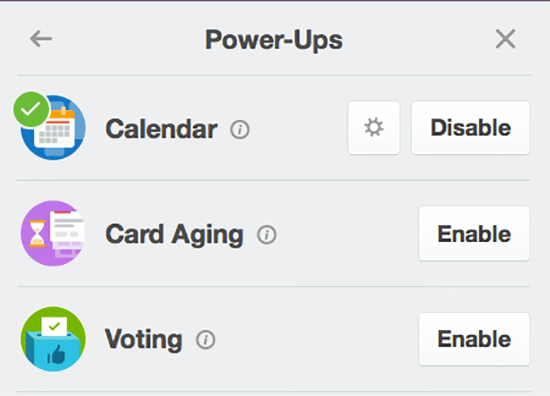 Another feature Trello has is the option to view your cards in calendar view. 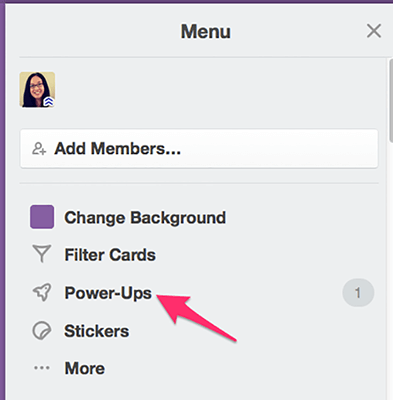 To activate the calendar view, click on Menu and then on Power-Ups. From there you can enable your calendar. If you feel you need more of a breakdown for your blog calendar, Trello also has checklists that you can create for each of your cards. 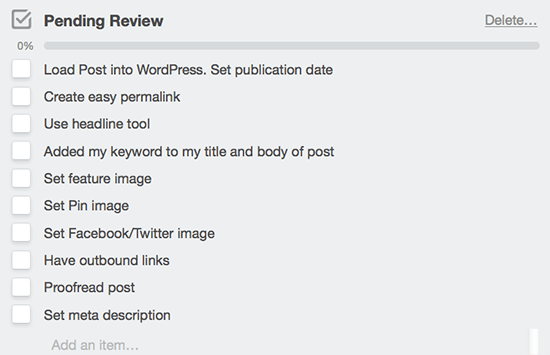 For example, here’s a Pending Review checklist for one of my blog posts in queue. Trello is free and easy to use for bloggers and freelancers. Another easy way to create your content calendar is with a spreadsheet. We’ve done the hard work here and have created a blog content calendar in Google Sheets to get you started. Our Google Sheet lays out the steps you need to go from the initial blog post idea in your head, all the way to publishing on WordPress (or your platform of choice). If you have multiple blogs, it’s a cinch to duplicate the master sheet and have your entire blogging business at your fingertips. Sometimes working on one master spreadsheet is the easiest for bloggers. You can see the whole picture of what’s going on with your blog content for the month or quarter and make adjustments along the way. Google Sheets integrates nicely with Zapier and lets you sync rows in your spreadsheet to other apps like Google Calendar, Evernote or Twitter. You could use this functionality to automatically create events in your Google Calendar, for example. CoSchedule is an easy-to-use content marketing calendar – with built in drag-and-drop features – that lets you plan, create and market your blog posts and social media postings all from one place. You install their free plugin on your self-hosted WordPress blog so it can communicate back with the paid CoSchedule service. CoSchedule can also import documents from Google Docs or Evernote and will convert those documents and images to a WordPress post. They offer a free two-week trial to test it out. The monthly plan starts at $15. After you sign up, CoSchedule asks to connect with your blog. You’re then directed to activate the CoSchedule plugin on your site. 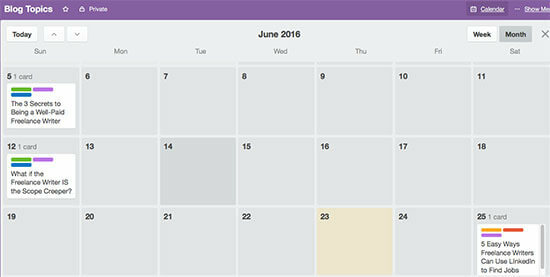 The plugin presents an editorial calendar view of your blog content. You can pick a day and create a spot for your upcoming blog post. What’s neat about this plugin is it has built-in access to CoSchedule’s headline analyzer too. Once you create your headline in the plugin, a post is automatically created with that title in your WordPress admin area – and set to draft status. The CoSchedule plugin also pulls in your already published posts and analyzes the posts’ headline and social analytics. Blogging as a hobby is fun; blogging as a business takes planning. Having a content calendar can help you manage your time and stay on top of your blog. It does this by breaking down the blogging process into manageable steps to follow. While using a notebook may have worked in the past, it isn’t going to cut it now. Instead, opt for a free tool like Trello. It’s your all-in-one calendar and checklist built-in. For a simpler version that you can even use offline, make sure to pick up our content calendar using Google Sheets. Finally, if you want more features such as analytics, social media posting and a built-in headline analyzer, check out CoSchedule’s free trial. Over to you – do you have a content calendar? What tool are you using to stay in check with your blog? Want exclusive content not found on the blog? As a Blogging Wizard subscriber, you get free access to our resource vault. Inside, you’ll find 15+ guides, templates and checklists. All designed to save you time, and accelerate your blog’s growth. Click here to learn more.